Are you an exhibitor or sponsor with questions about the NTC? You’ve come to the right place! Below are some commonly asked questions, but if you don’t find what you are looking for just email eileigh@nten.org. 1.What's included in the exhibitor package? Up to three (3) additional exhibit hall-only/booth staff badges for $250 members / $400 non-members. After February 1, 2019 the cost increases to $300 members / $500 non-members. Up to four (4) full conference registrations at the early bird registration rate until February 15, 2019. Member/non-member rates apply. Do you have an example of a booth? This is a standard 10×10 booth. The easiest way to register your staff is through the Exhibitor Portal via your unique URL. Who is our exhibitor services contractor? Who do I talk to about shipping/furniture options/ordering services for our booth? Freeman is our exhibitor services contractor. The exhibitor kit and online ordering are available in the Exhibitor Portal and you can also visit the site directly here. Can I do my own shipping? You are welcome to arrange your own shipping through FedEx or another carrier. You can either ship in advance of the show to the Freeman warehouse or directly to the convention center. In either case, please refer to the deadlines and shipping instructions in the Freeman exhibitor services kit to avoid additional handling costs or lost packages. What are the shipping instructions? Please note that pricing varies depending on the dates of your shipment. Refer to the Freeman Exhibitor Kit/online ordering for more details or contact them directly at: (888) 508-5054. 777 NE M L King Blvd. Yes! And we strongly advise that you arrange post-shipping in advance rather than onsite after the event because prices will be higher. You can do this through our exhibitor services contractor. 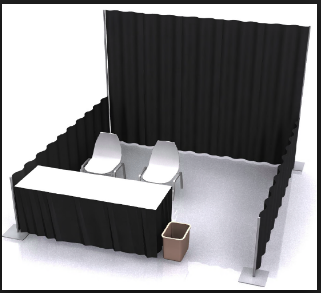 What else should I order for my booth? We design our exhibit packages to provide a turnkey setup for those who want to expend minimal effort and maintain lean budgets. All you need to set up your booth is your signage, your promotional materials, and a stack of business cards. However, there are a lot of ways to customize your booth and enhance your onsite experience. Furniture upgrades, hardline internet, in-booth catering, carpet padding and additional AV services and rentals will be available through our exclusive contractors. You can find a link to their order forms in the exhibitor portal and throughout this page. How do I order AV services for my booth? Exhibitors can pick up their badges at the registration desk from 11a – 8p on March 12, and then during regular registration hours thereafter. When should I be at my booth? This year we are providing lead retrieval for all exhibitors. Please log into the Exhibitor Portal to select your device. If you’d like to purchase additional lead retrieval services beyond what we are providing, you will be able to do so through our service provider Expo Logic. You can order additional services onsite or online here using code NTEN2019. Sponsors and exhibitors may record video in the Exhibit Hall, specifically, Hall D. They may not capture video in breakout sessions, the general sessions, or in hallways of the convention center. Amy Sample Ward, NTEN’s CEO, is available to schedule 2 to 3-minute interviews with exhibitors and sponsors. Be mindful of the communities you serve. We suggest bringing diverse staff to be at your booth. Refrain from cultural appropriation such as imagery and themes in the way you present yourself to the NTEN community. Please use gender neutral language such as “you all” or “y’all” instead of “ladies”, “gentlemen”, or “guys”, and be aware of the gender pronoun ribbon on attendees’ badges. The NTC is a community-oriented event! Join in on Dine Arounds, Birds of a Feather, parties, and the NTC forum, for example. Consider the impact of your swag, especially the use of plastic. If you’d like ideas about where to purchase greener items or for swag alternatives, email eileigh@nten.org. Please review the Oregon Convention Center waste reduction guide and video. In order to make your booth accessible to people with disabilities, simple alterations can be made to remove or modify physical barriers and provide accessible promotional materials. Set up displays to allow those using wheelchairs to easily enter the booth and view materials. This can be done by: lowering displays or counters and ensuring there is ample entrance space. Provide order forms or promotional materials in alternate formats such as large print, computer disks, or thumb drives for persons who are visually impaired. Make sure carpet is smoothly laid out and that any cords are securely taped down so as not to hinder wheelchair users from accessing your booth. Please contact Freeman if you notice a potential hazard. Videos should be captioned for persons who are hearing impaired. Approach persons with disabilities with a positive, relaxed attitude in the same way you would approach any other prospective customer. If attendee is deaf and with an interpreter, always address the attendee directly, not the interpreter. Plan in advance how you will welcome people with disabilities into your booth. If altering your display is not an option, make up in service what you lack in “architecture”. Here are some tips and opportunities for engaging with the NTEN community before you arrive and throughout the event. Online Community Forums: Introduce yourself and connect with other attendees in the 19NTC community forum. Every registered attendee (including sponsors and exhibitors) can access the forum. You can also connect with community members year-round in NTEN’s online community platform. Mobile App: Download the conference mobile app to introduce yourself and network with other attendees. As with the forums, be your authentic self and let the community experience your expertise. Attendees will get the chance to become more familiar with you before we even get on-site. Looking for more ways to get involved? Participate in NTC events! Go to Dine Around Portland on Wednesday, March 13 from 6-8pm. Volunteer in the Career Center as a resume reviewer or a mentor. Attend the NTC Official Party on Thursday, March 14 from 7-10pm (additional purchase). Can we give away foods/drinks/treats from our booth? Giving away food or drinks (other than pieces of candy) requires working directly with the convention center’s catering team. Catering in the Exhibit Hall must be purchased through pacificwild catering, including bottled water.